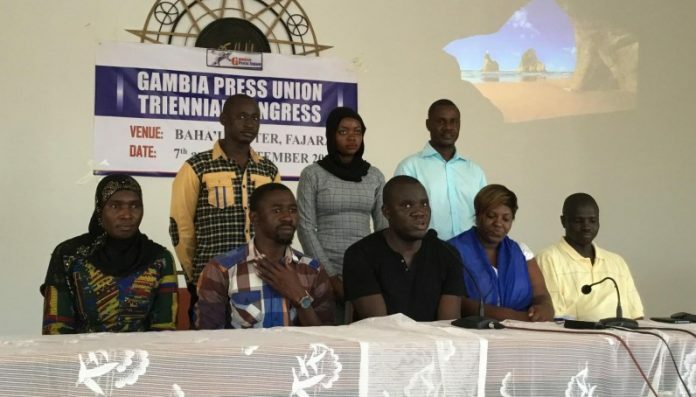 Fajara: January 22, 2018: A Gambia Press Union delegation Tuesday paid a courtesy visit to the Truth, Reconciliation and Reparations Commission (TRRC) to discuss issues geared towards strengthening the relationship between the media and the Commission. The GPU delegation, led by Mr. Sheriff Bojang Jr., President of the country’s umbrella union and professional organisation for journalists, was received in audience by Dr Baba Galleh Jallow, the Executive Secretary of the TRRC, himself a veteran journalist. Mr Saikou Jammeh, the GPU Secretary General, said: “It pleases us, greatly, that one of our own is leading this important national process and we are here to convey our delight about that and to offer our support to the work that you do to make it a success. The meeting also discussed issues around improving the environment for news coverage of the TRRC processes by journalists, including offering continuous training programmes for journalists covering the Commission. He spoke on the importance of the TRRC to the media and provided guidance to the GPU leadership on how to effectively engage with the TRRC towards addressing violations of the rights of media professionals. Dr Jallow clarified a number of issues surrounding media coverage of the TRRC and assured that his office is ready and willing to support the work of the journalists, especially those covering the TRRC. He offered to provide access to internet facilities and a space for journalists to work from.